Congratulations to the five category winners of the 2018 Western Cape Entrepreneurship Competition. 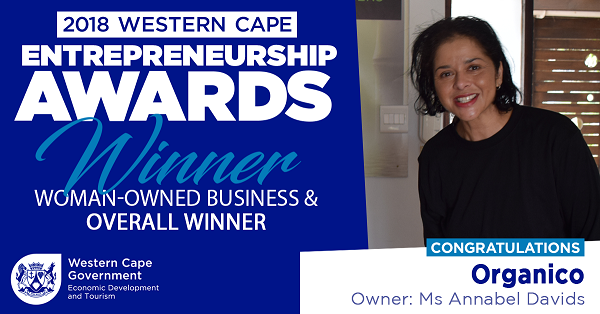 On 21 November 2018 the Department of Economic Development and Tourism presented the Western Cape Entrepreneurship, Expo, Summit and Awards. 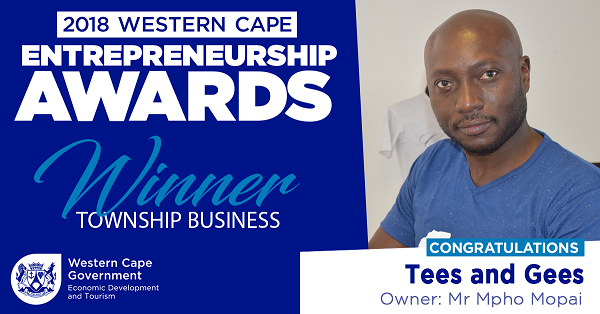 The aim was to recognise innovative entrepreneurship and those displaying business excellence in the categories of: Emerging Business, Women-owned Business, Social Enterprise, Most Innovative Business and Township Business. Organico, headed by Annabel Davids - winner of the Women-owned Business - was also announced as the overall winner. 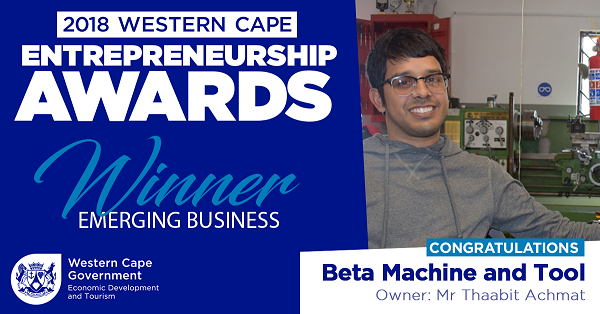 Located in Zeekoevlei, Beta Machine and Tool is an engineering manufacturing business that specialises in toolmaking, welding and machine repairs. The company was founded and is run by a young, passionate entrepreneur who, despite his physical disabilities, has put all his natural abilities and training as a mechanical engineer to run a profitable business that also designs and manufactures performance parts for motor vehicles. The business currently employs 2 permanent staff operating out of a well-equipped workshop, and is on the path to growth. Quickloc8 is an app developed for and used by taxi owners to manage their drivers, reduce on-road accidents, and improve overall safety in the taxi industry. The app runs cutting-edge technology to provide real-time updates on taxi activity with the aim of, through partnering with local taxis owners and their associations, finding practical solutions to modernising the taxi industry. The Milnerton-based business further endorses its commitment to socioeconomic redress by hiring unemployed graduates who are upskilled and used to provide tech support to clients. Originally named Organico, Oco Life is an aroma & holistic lifestyle store that uses traditional African herbs such as Imphepho to create organic essential oils. In a country struggling to meet the basic healthcare needs of all its citizens, Oco Life seeks to provide the public with safe, effective, and natural health solutions. The company places much emphasis on making significant social impact, while contributing to the Green Economy is core to the business model. Run by the fiercely driven and enterprising Annabel Davids, the woman-owned business has created 12 permanent and 14 part-time jobs for residents in Masiphumele township, close to where the business is located. Oco Life is currently prototyping a cannabis grow box for home use with the South African Bureau of Standards (SABS), while they are also in negotiations with Clicks to supply their stores. They are most excited about potentially growing these uniquely African products globally, with work being done to explore the export market. Ma Wami is an NPO (Trust) which invests in persons, especially the youth, living with hearing disabilities. 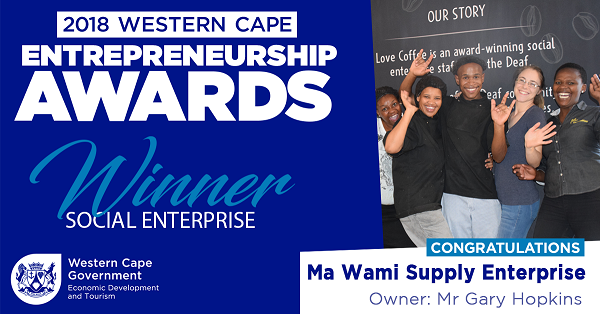 The beneficiaries of Ma Wami are trained as baristas and chefs in a retail outlet named “I Love Coffee” located in Woodstock. I Love Coffee is a registered company which trains and creates job opportunities for young people living with hearing disabilities. Unique stories which reaffirm this commitment to creating opportunities involve considerable upskilling of all employees, including those initially hired as cleaners, and empowering them with the capabilities to manage even the more complex operations of the business. Overflowing with the exuberance of a young, spirited staff, I Love Coffee currently has eleven permanent and five part-time employees, while they have recently expanded into Claremont; with plans to further grow its existing staff compliment. I Love Coffee shares a commitment to the Green Economy by manufacturing its own bio-degradable coffee pods, with 85% of those profits reinvested into the business. Tees and Gees designs and retails t-shirts that celebrate Cape Town and Africa, having started out on selling t-shirts on a busy street corner in Gugulethu township. 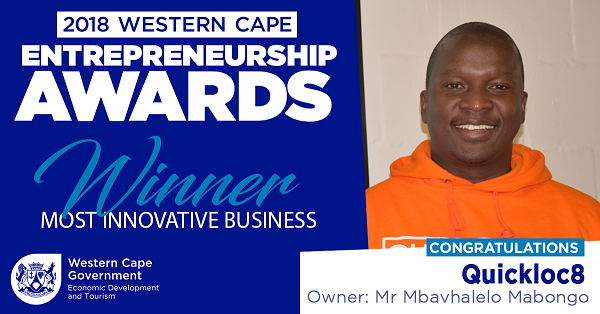 After initially undertaking the entire production cycle internally, owner Mpho Mopai decided to outsource much of the production activity to other township enterprises. He will source the fabric himself, before having different township-based businesses, from Eerste River to Mitchells Plain, make valuable additions to the final product. Tees and Gees employs four permanent and eight part-time staff members, while it simultaneously offers a manufacturing service to other designers. The following businesses were identified as the best in the Agri-Processing, Digital, Tourism and Creative sectors. Fruitlips produces mouth-watering jams, marmalades and sources for the retail market. Mido Technologies integrates technology into the classroom by training leadership and teachers of disadvantaged schools. Hungry For Halaal is a desktop and mobile friendly platform that focuses on the halaal market locally and internationally. It offers first hand reviews as well as user reviews and ratings. Halaal business are able to list in specific categories e.g. marketing in the form of paid listings, and banners and social media marketing for greater exposure. Bili Bead-Wear produces handcrafted removable bra-straps.